There's not much a fairly privileged white guy who hails from the suburbs can say about diversity or racism without being questioned. Compared to many other people who don't hail from WASP backgrounds, most of my challenges are pretty easy. I don't come into life fighting against a biased expectation of who I am or what I'm capable of. I don't immediately find that people assume I'm not smart enough, or honest enough, or trusted enough to participate in their workplace and their communities. Things are remarkably comfortable. Speaking up or talking about hard issues like racial bias or diversity, or calling for attentiton to inherent problems, makes it possible I'll misspeak and say something quotable where I don't want it. It's instead much easier to sit quiet and let other people fight their battles - to watch big conflicts and flareups remotely, trivializing someone else's experience, as something that's not happening here. But even in the 'burbs, and in our corporate offices, there are issues. We may not see unarmed men shot 12 times and killed in our hallways, but there are opportunities to bring down or build up our peers daily, and most of us aren't doing much to aid their quiet struggles. 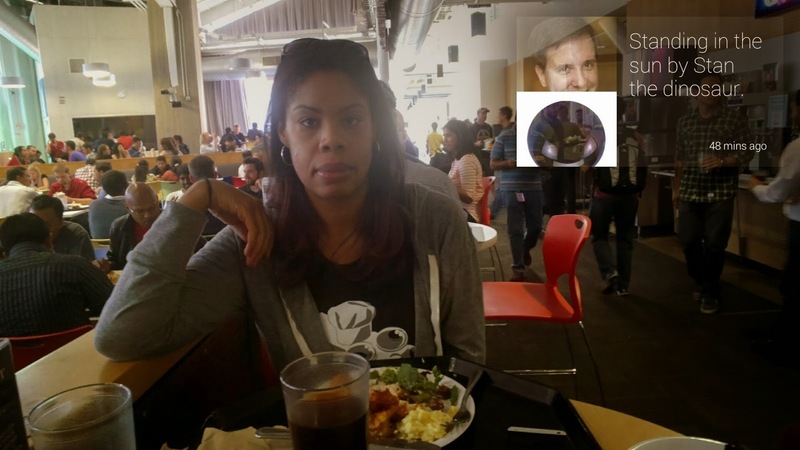 Earlier this month, one of my best friends, +Erica Joy, who works with me here at +Google, talked about how bias has worked against her, as a black woman, in a predominantly white and east Asian world. Her piece "The Other Side of Diversity" removes the abstract anonymity of company statistics and tells you the direct reality of what it's like as someone who walks into a position where people may have already made their mind up about you, where your mere presence may make them uncomfortable, and where artificial limits are put on your potential. 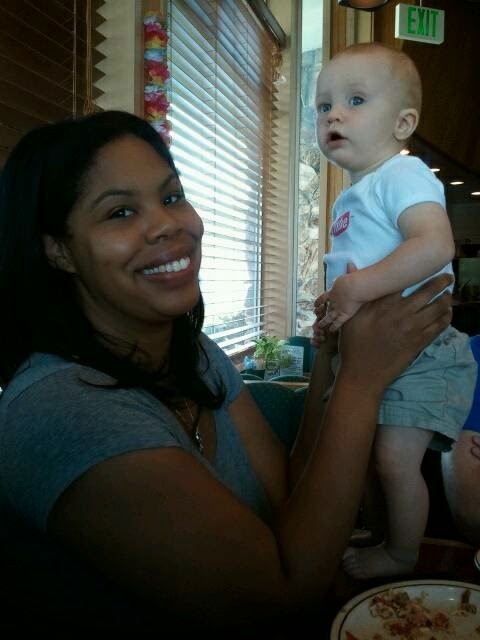 I've known Erica for about seven years, and have been colleagues with her for the last three plus. She's the kind of person who I've always felt free to open up to and tell her just about anything. She's clever, insightful and hilarious - if you take the opportunity to know her. She's also especially thoughtful. She can be a sharp critic when our products don't work well, and she can push back on me if I say something daft that needs revision or clarification. And yet I know not everyone is open to finding out her personality, and as she spells out in her piece, as well as the follow-on "No Solution", her professional career (and personal no doubt) has been impacted, multiple times, by the shortsightedness of others. While I may comfortably sit on the side where I don't have to fight for inclusion, it's incredibly frustrating to see this happen time and again, whether people are strong enough, like Erica, to speak up about it, or they remain in silence. For no matter how you carve up the numbers being shared from our workplaces, we have some obvious gaps in our nurturing, recruiting, hiring and retention practices - which extend a gulf in our representation of women and minorities in tech. This is a systemic issue at all levels, and while I know companies (including mine) honestly are working hard to improve things, the day to day realities can't be glossed over with an expectation of prettier futures. Sometimes when Erica and I get together, we joke about seeing if we can hit a quota of spotting more people like her (namely black women) on campus - like the proverbial unicorn. If we can find two more (not including her) over a standard lunch visit, we've done pretty well. Sometimes, depending where we walk or where we're eating, we see more. Other times, none, as streams of geeky white guys (like me), and assorted people from all other directions walk by. "I feel like I’ve lost my entire cultural identity in effort to be part of the culture I’ve spent the majority of the last decade in." -- "The Other Side of Diversity"
If you have to change who you are to fit into the culture, maybe it's the culture that needs changing. I've been lucky enough, even as a dumb white guy from the burbs, to have had some experiences in fairly open communities. I'm glad I attended UC Berkeley, which was even more diverse when I attended school there in the late 1990s than it is now, and for all its continued challenges, I believe Google has its heart in the right place to empower people from all different backgrounds, and is working on it from multiple directions. While my neighborhood isn't the picture of diversity, I've always followed and engaged with stimulating people online, no matter their racial makeup. As a numbers exercise, I did a quick count a week-plus ago of those whom I'm connected to online. Of the 246 people I'm mutual friends with on Facebook, for example, only eight are black. That's 3.5%. If I edit the count to remove immediate family members, or colleagues, to only include friends I've hand selected as acquaintances, that goes up to 4.5%, ahead of the Santa Clara County percentage of 2.9%, but behind the California percentage of 6.6% and the national census of 13.5% or so who self identify as black. And really, what constitutes a good number anyway? I can't look at my social networks, pick a few dozen black avatars, add them to my circles and call it a day. There's no seal of approval that clarifies whether I'm part of the problem or part of the solution. The Ferguson incident and its ongoing echoes has the topic of race back in the headlines again. And eventually our short attention spans will migrate on to some other hot issue of the day, while the family and community suffers permanent scarring. But for many of our friends and peers, this is not a one day, one week, one summer type of challenge - but a lifetime. We can abstract the Valley's diversity issues into sets of percents, charts and graphs, and cite our efforts with dollars spent or scholarships awarded, but whatever we do, we have to keep pushing and it starts with a recognition that something is broken, and we need to be aware of it. We need to encourage people who run into these trials daily to speak up, and to please be themselves. We are better because of our differences. The prevailing mantra holds that as our phones become increasingly smart and constantly connected, that we're walking around with the equivalent of computers in our pocket. These intelligent devices can do practically everything their PC predecessors could, from email and web browsing to document sharing and creation, music and photos, and any application you can think of. In fact, I'd argue that we're not only seeing people spend more hours with their mobile devices than traditional PCs, they're more functional as well - as the smartphone has surpassed the PC. Ever try taking photos with your iMac? It's tough. Now, instead of considering these phones and tablets as miniature computers, which are used to access our desktop content on the go, we're seeing the reverse take place. The smartphones are initiating the activity, and the desktop connects us to the results. Instead of many small computers in our pocket, our PCs are essentially larger versions of our phones - and we come to our Web browsers and desktop apps to pick up where our phones left off. Not too long ago, it was common to expect apps to be made for our smartphone platforms that were extensions of our Web experiences. These simple mobile apps were wrappers for our cloud-based data, or simply sucked down web pages and media, but didn't offer experiences that were enhanced by being mobile. It was just a mirror of what you could get on the desktop. However, as the app ecosystem exploded for iOS, Android and other platforms, coding for the smartphone became the primary destination and effort for new companies and ideas. 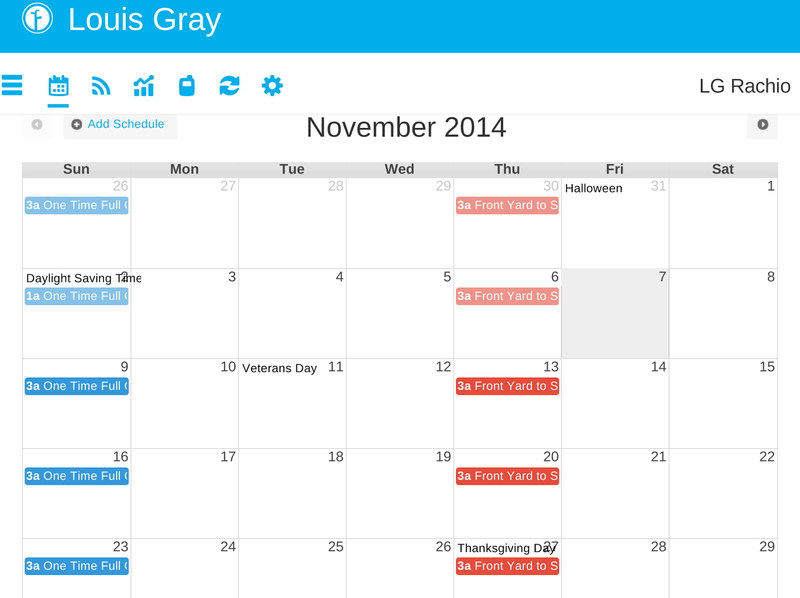 Automatic's Web dashboard leverages data from the mobile device. You could see this evolution go in a a three step process, from "Mobile too" to "Mobile first" and in many cases now, "Mobile only." Mobile experiences can't just be a shadow of the desktop version, but instead are now carefully crafted to meet rigid design expectations, with a user experience that adapts for smaller screens, and gets better with understanding of the user's location data or other apps installed on the phone. We're spending more and more time inside of our mobile apps, which can be our primary messaging and sharing vehicle, our second screens while watching TV or using the desktop, or a constant companion - to the point we hold them in our hands as we walk everywhere, or put them out on the table in front of us wherever we may go, waiting for the next chirp to grab our attention. 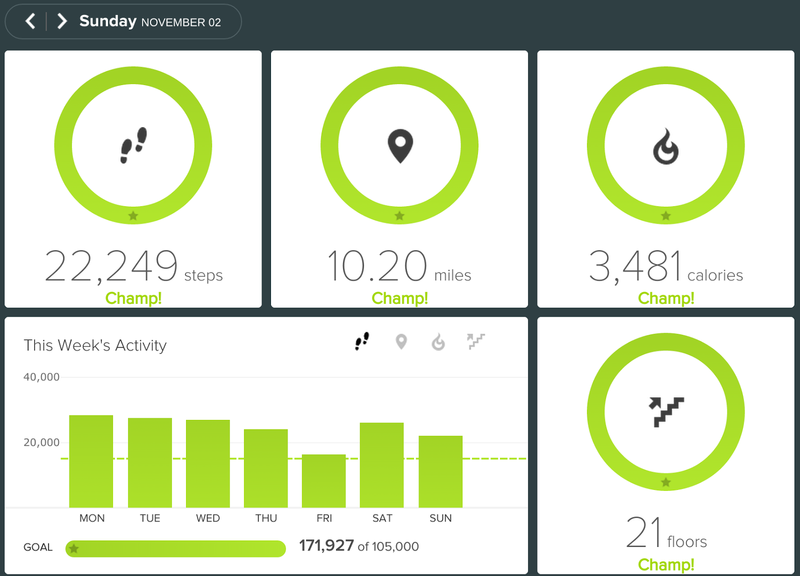 Fitbit takes its data and makes smart charts and graphs on their site. The natural evolution of this mobile first, mobile centric reality is that we're now no longer going to our phones to pick up where our desktops left off, but the reverse. And when I do end up in front of a full-sized keyboard and monitor, I'm clamoring for smart Web experiences in my browser that reflect activities that have happened on the phone. 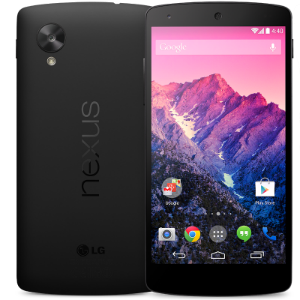 If it's a miss, I may end up closing my laptop and picking up my Nexus 5 instead. For applications that are primarily experienced on mobile, seeing a strong Web interface that contains the same data as on mobile is a pleasant surprise. 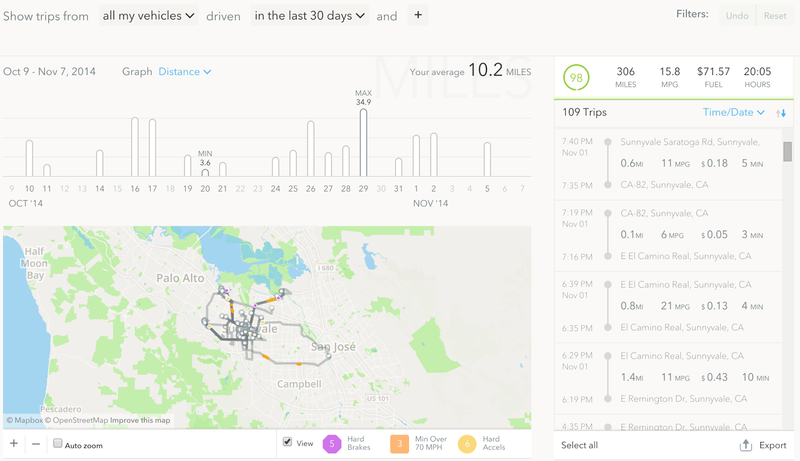 You can see this difference in the way Fitbit has worked hard to have a great Web experience to mirror mobile, while the Moves app does not. Automatic and Rachio have a workable Web experience to match their mobile version. 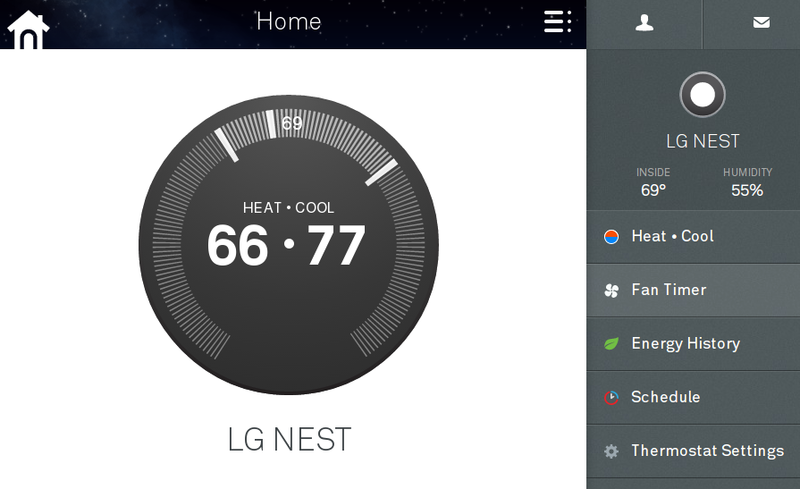 Managing the Nest thermostat via the Web - same as the app. Not too long ago, trying to use the Web and get data on our phones was exasperating. We had subpar experiences, had to make excuses for short email replies, or say we'd get to something when back at the desktop. But now, often, when at the PC, you're pining for what's on the phone - even if you can send texts or make voice and video calls from the browser. It's delightful to see when the two are working in sync, and the desktop experience makes the phone experience better. As a user, I'd be delighted to see the front-end experience for the same shared back-end data become more in sync and know the devices are working well together for every service.